The Xiaomi Mi Mix 2S is one of the best flagship releases we saw from Xiaomi in 2018. It packed an incredibly powerful punch with its Snapdragon 845 SoC, 6/8GB RAM and 128/258GB internal storage variants. While the Mi Mix 3 is just around the corner to being released globally, it’s a great time to muck around with modding your Mi Mix 2S. In this guide, we will show you how to unlock and root the Xiaomi Mi Mix 2S. This is accomplished with either TWRP and Magisk, or TWRP and SuperSU for the global ROM. We will also show you how to swap out from a Chinese MIUI ROM to the global ROM, and how to install Google Apps on the Chinese ROM. Basically, this is a Mi Mix 2S mega-guide. 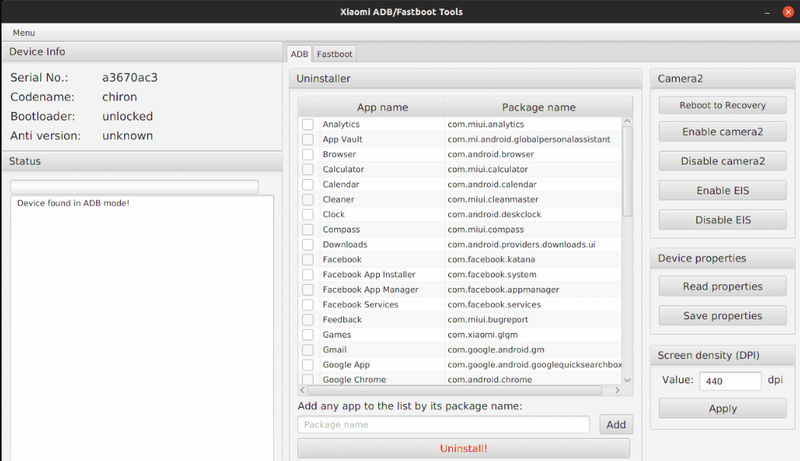 If you hate repetitively typing ADB commands, an XDA user just recently released “Xiaomi ADB/Fastboot Tools”. This tool is a GUI-based version of ADB and Fastboot, specifically developed for Xiaomi phones. It can do many ADB and fastboot commands, such as de-bloating your Xiaomi device, flashing ROMs / recovery, and unlocking the bootloader, all with a click of a button. For the purpose of this guide, we’ll be sticking to the traditional ADB methods, but the tool is worth checking out. Note: Unlocking your bootloader will trigger a factory reset on your device. Also, receiving an official unlock code from Xiaomi may take up to several days. Keep this page saved for when you receive your official SMS from Xiaomi. On your Mi Mix 2S, login to your MIUI account (or create a new one, if you don’t have one already). Enable Developer Mode under Settings > My Device > All Specs > tap MIUI Version 5 times. You will receive a toast. Go to Settings > Additional Settings > Developer Options > enable OEM Unlocking. Go to MI Unlock Status and tap “Add account and device”. If you receive an error message, you may need to use a VPN that connects to a city in Mainland China, like Beijing. Download the MIUI Unlocker tool on your computer. Launch it and login with your MIUI account. Apply for unlocking permissions with your MI account. Now you wait for an SMS confirmation code from Xiaomi, which may take several days. When you have your confirmation code, enter the code in the MIUI Unlocker tool. Connect your Mi Mix 2S to your PC via USB, and click the “Unlock” button. Sometimes, Xiaomi forces you to wait up to 15 days to unlock your device, even after receiving the SMS confirmation. If this happens to you, you have no choice but to wait. If you try to repeatedly unlock the device before the forced waiting period, your MI account may become blocked. Download the TWRP .zip from the link above. Extract the .img file and copy it to your main ADB folder (alongside adb.exe). Turn off your Mi Mix 2S, and boot into fastboot mode (hold Volume Down + Power). Connect to your PC via USB, and launch an ADB terminal (hold Shift + right click, choose ‘Open a Command Window here’ from your main ADB folder). After your phone reboots into TWRP, you can choose ‘Reboot to System’ to go back to Android. If you will root your device with Magisk, continue to the next section of this guide. Global ROM needs to root with SuperSU. If you want to flash global ROM over Chinese ROM, follow the next section before proceeding to root. Download Global 9.5 or MIUI 10 Android Pie (leaked Global version). Copy the ROM .zip to your external SD card. Boot into TWRP, and tap Wipe > Advanced > choose Dalvik Cache, System, Data, Internal Storage, and Cache. Tap Install > External SD > choose the ROM zip, swipe to flash it. Repeat the same step for the region fix .zip file, swipe to flash it. Tap Reboot > System, and complete setup of your Mi Mix 2S. Transfer the Magisk or SuperSU .zip files to your external SD card. Boot your Mi Mix 2S into TWRP. Tap Install > External > flash the Magisk zip (or SuperSU. Reboot to system, confirm root with Magisk Manager or SuperSU app! The Chinese ROMs do not have Google Apps. There is a method for installing them. Download this Oreo Google Apps package. Extract it and transfer all the APKs to your device. Install every APK from 1 to 6, but do not launch them after installation! Do not install the last two APKs. Download and install the Updated Contacts Sync APK. Now go to Settings > Installed Apps, and find every Google App you just installed. Select each one, and enable the Autostart permission. Go into Permissions and enable all permissions for the Google Apps. Reboot your Mi Mix 2S. Add your Google account via Settings > Sync > Add Account > Google. To enable Google Maps Location Sharing, download the “Unlock CN GMS” Magisk module through the Magisk Manager app. Reboot phone, then install Terminal Android from Play Store. Launch the Terminal Android app, grant it root permissions when prompted. Now you can reboot, and your device should pass SafetyNet. If you want to flash a custom ROM, there are a few available for the Xiaomi Mi Mix 2S. These can be flashed through TWRP.